From north to south, east to west, discover fascinating villages and towns, explore beautiful countryside and a coast of clear waters. 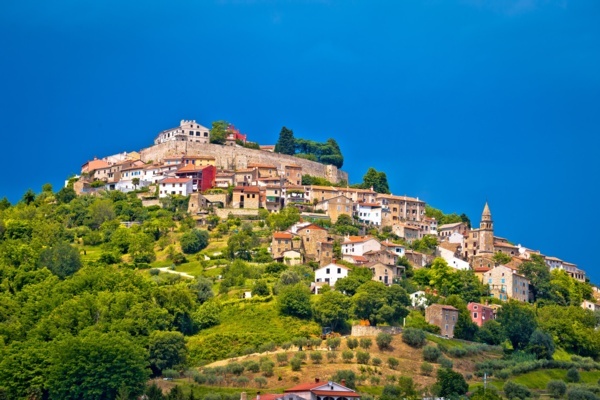 Perched atop a lush, green hill is the medieval town of Motovun, the heartland of 'truffle country', a forested area world famous for this rare delicacy. Oprtalj is equally impressive with the brightly painted façades of beautifully restored buildings standing as testament to a rich architectural heritage. Sleepy Sovinjak offers one of the most dramatic views in the whole of Istria. South of here, hilltops punctuated with cypress trees give way to rolling fields and woodland dotted with stone-built villages, some bustling, some with just a handful of residents, all equally captivating. Explore the west coast towns: enjoy the sunsets from waterside Umag; Poreč, overlooking the sea with its grandiose Byzantine basilica, a UNESCO world heritage site; Vrsar looking down onto a marina where fishing boats snuggle up to luxury yachts; and Rovinj, all pale, pastel painted waterfront façades whose old town is a clenched fist of cobbled alleyways and captivating Venetian architecture. Take in the dramatic Limski Kanal, a fjord like rift which stretches inland and is rich in fish, oysters and mussels or visit the Brujini Islands, a small archipelago and a historic conservation area. 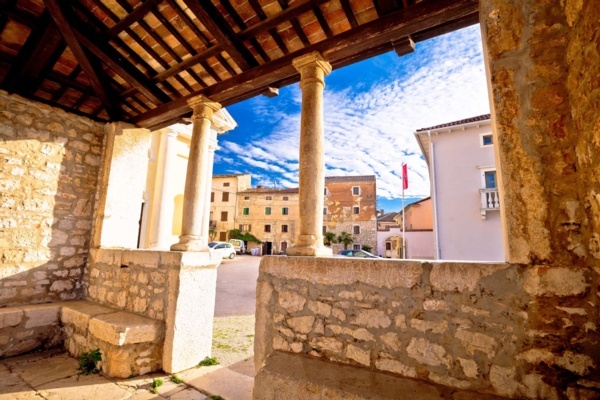 Historic Barban with its grand baroque gate (Vela Vrata) announces the rugged eastern coastline where Labin, with its wealth of soft ochre painted palaces, offers views over the Gulf of Kvarner to the island of Cres. The towering campanile of St Blaise's church in Vodnjan, modelled on St Mark's in Venice, is the tallest in Istria and as the patron saint of singers it is not unusual for opera stars to visit the church prior to performing in Pula's amphitheatre. The Romans established Pula; their rich legacy includes the Forum, the temple of Augustus and the amphitheatre, the fifth largest in the world, which today plays host to summer concerts and festivals. A lively market also takes place daily. Croatia's coastline is indented by wide bays and sheltered coves lapped by warm Adriatic waters renowned for their clarity. Most Istrian beaches are of the shingle, pebble or weathered rock type with the sea temperatures usually reaching a peak of around 22-25°C in August and September. Istrian cuisine is comparable to Italian and French gastronomy with a central European influence. Hearty Istrian soup, maneštra, is an equivalent of Italy's minestrone, rich in beans, vegetables and, sometimes, cuts of meat. Spicy sausages, game and various grilled meats are widely available as well as a lovely array of fresh seafood. Fuži is a homemade pasta often served with a helping of goulash, asparagus, mushrooms or wild boar. Istria offers an overwhelming choice of truffle based dishes including polenta topped with melted truffle cheese, veal in truffles or ombolo, a semi dried grilled meat, softened by a rich truffle sauce. Seafood such as octopus, squid, mussels and scampi is ubiquitous; the scampi is served in its shell, the size of jumbo prawns, often on a bed of pasta in a sauce known as buzara, made from garlic and white wine. For dessert, try pancakes (palačinka) filled with chocolate, ice cream, walnuts or jam. Accompany your meal with a locally produced wine such as Degrassi, Koreniki, Arman or Matešović. 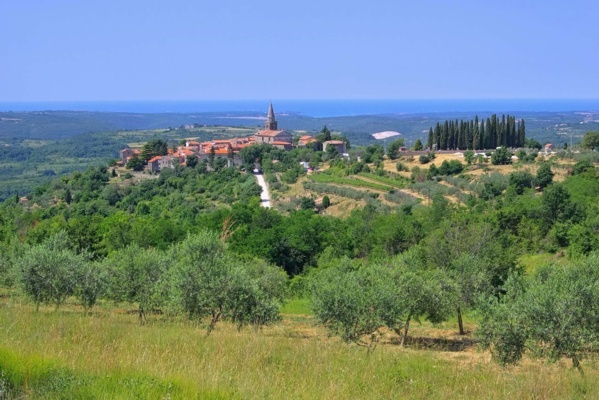 Istria enjoys a largely temperate Mediterranean climate. In the spring and late autumn, days will be comfortably warm with cooler nights. Summer months are hot, tempered by a cooling breeze in the evenings. Pula airport offers the easiest access to our houses in Istria, within a 1 hour drive. The airports of Trieste (Italy) and Ljubljana (Slovenia) provide alternative options and are within a 2 hour drive of the majority of our properties. The variety and choice of flights from UK airports to European destinations is considerable. We do not tie you in to a package holiday with prearranged travel; you are free to choose flights from your closest airport using any charter, scheduled or low cost airline. Vodnjan is dominated by its Venetian bell tower, the tallest in Istria, and, like a welcoming beacon, beautifully illuminated at night. The town is on a hill surrounded by olive groves, tobacco fields and vineyards. As with so many of Istria’s towns, Vodnjan was a Roman settlement and later ruled by the Venetians from the 14th to the 18th century. At Vodnjan’s heart is a number of buildings in Venetian-Gothic style, and it is home to one of Istria’s best restaurants, Vodnjanka. 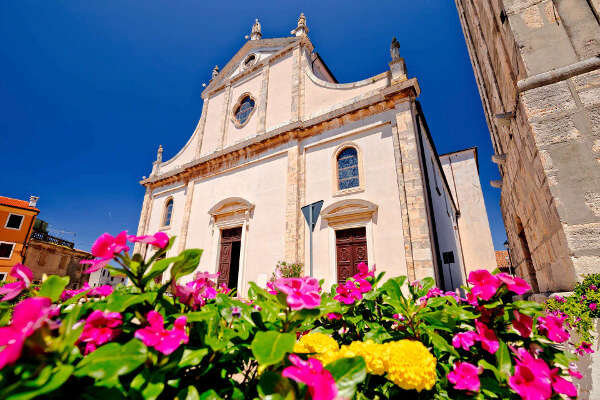 In north-west Istria, the small town of Vižinada can be found. Originally on the crossroads of the main western artery running from Italy and Slovenia into Istria, Vižinada is now quieter following the building of a major new road further west. On Vižinada’s north side, a couple of vantage points offer superb views over the hilly countryside towards medieval Motovun. 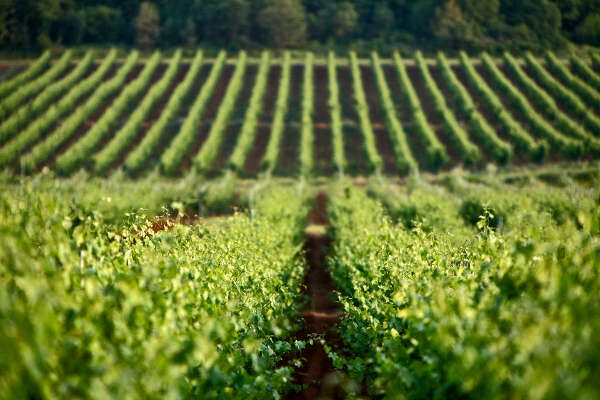 This is prime olive and grape growing territory - the lines of groves and vineyards can be seen all around Vižinada. 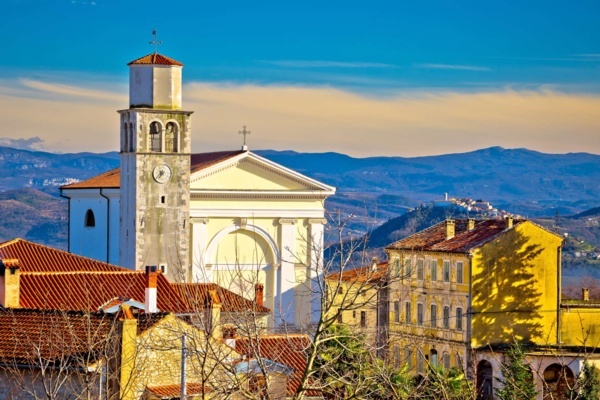 One of Istria’s most popular medieval hilltop towns is leafy Grožnjan, a delightful tangle of pedestrianised cobbled streets lined with boutiques, galleries and workshops selling artwork, clothing, jewellery and ceramics, all locally produced. Add in a selection of irresistible cafés, some with fantastic views, and a couple of restaurants and your day out is complete. Wonder as you wander, absorbing Grožnjan’s wonderful architecture, archways here, stairways there, with occasional glimpses either across the Mirna Valley or out to the shimmering Adriatic Sea, all to the soundtrack of jazz or classical music, emanating from the home of Istria’s young people’s music academy, based in Grožnjan. They might be crumbling a little these days, but Sveti Lovreč’s fortified town walls, hundreds of years old, still clearly define the old part of this charming little town. The fortifications in evidence today date from Venetian times when Sveti Lovreč was the seat of military administration. Look for the recurring Venetian symbol, the lion of St Mark adorning Velika vrata, the main gate to the old town. These days Sveti Lovreč is a bustling town with busy cafés and a popular pizzeria, San Lorenzo, which fires up its ovens from early afternoon. Vineyards surrounding Sveti Lovreč contribute the grapes used by the renowned local winemaker Matošević. Crowning the top of a hill as though standing guard over the truffle-rich forests of the Mirna Valley below, medieval Motovun must be visited. Whether to browse in its bohemian shops or to dine in a number of excellent restaurants, to marvel at the wonderful architecture or simply absorb the spectacular views whilst wandering around the town’s walls, Motovun offers much. Drop in over the last weekend in July to see film screenings from around the world as part of the annual international Motovun Film Festival.